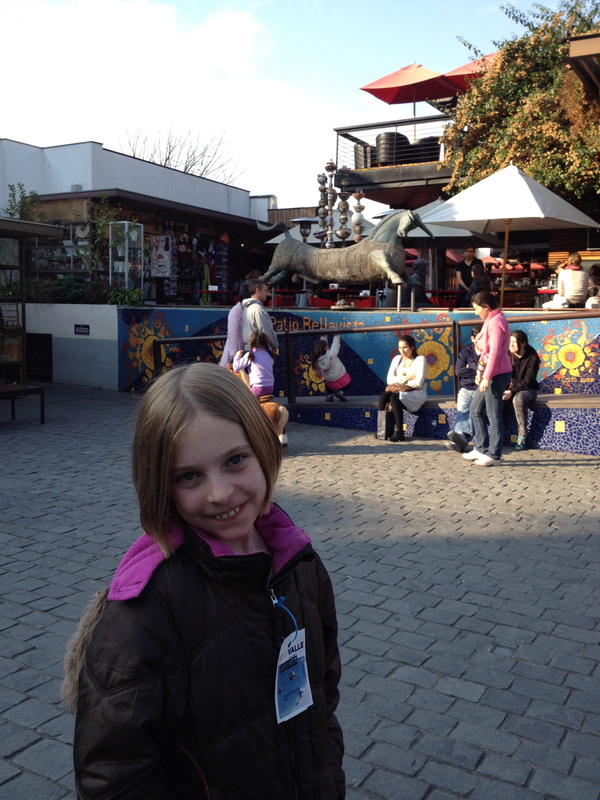 A smaller enclave of Barrio Bellavista is Patio Bellavista which is a more touristy group of shops and restaurants. In fact, like many “bohemian” areas in big cities, Patio Bellavista seems to cross over into the more unauthentic tourist trap, but as tourists, we really love it. The tourist factor has probably also lead to an increase in security in the area. Our friends have warned me that I need to always be careful with my purse. While I’m always careful, I was surprised to see how far they take it at Patio Bellavista. I first thought these giant lanyards might be for college kids to carry an oversized cocktail around their neck. I learned that they are actually used to strap your purse around the table, preventing a thief from running away with it. 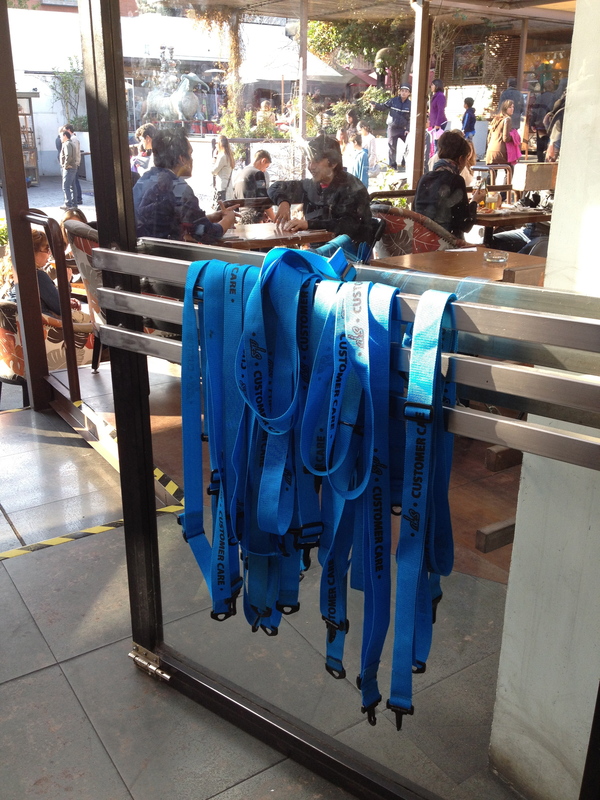 Straps provided at restaurants at Patio Bellavista to secure your handbag to the table. As for dining out, We continue to struggle with translating an average menu to figure out what the kids will eat. Everything is just a bit different, no matter how similar if appears to be at first glance. Our latest example of this was our order of lemonade by Jack. We were so pleased when the waiter acknowledged that they had lemonade…until we received it. Turns out what we ordered translated to a shot glass full of lemon juice and two packets of sugar. We all had a great laugh! 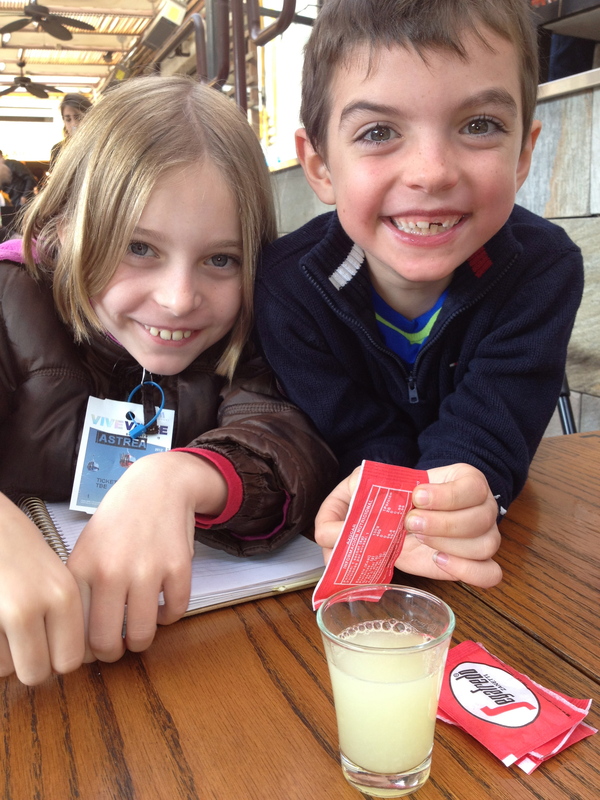 And, in the spirit of “going with it” we asked for a glass of ice and managed to create our own lemonade. This entry was posted in Barrio Bellavista, Patio Bellevista, Places to Explore, Restaurants and tagged restaurant by kierstenmurnane. Bookmark the permalink. Ha! Given my gals’ unnatural level of interest in sugar packets (they are eagerly awaiting hitting legal espresso drinking age!) I am sure they would be lobbying for a move south if I share this with them.